Buying and Adapting an Access Vehicle. 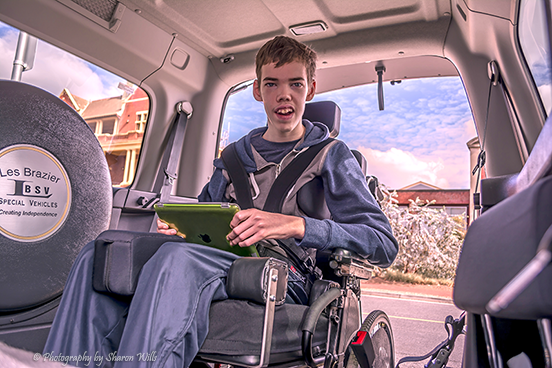 Jarod's mum, Sharon was asked by Source Kids Magazine and Variety Org about her experience with purchasing and adapting a special needs access vehicle with wheelchair ramp and hoist. Here's her answers. Please note: Services may vary depending on where you are in the world. This is based on what is available in South Australia. As a teenager, nearing adulthood Jarod was too big to be comfortably transferring in and out of our vehicle. Not to mention that we as parents are both in our late 40’s and the physical strength required for the manual lifting is failing us. Our bodies are reaching physical limits and back injuries seem to have become a common occurrence. It’s also a substantial weight to lift a manual wheelchair into and out of the back of the vehicle for each use. A van is the last sort of vehicle we would purchase for the money if we had any other option. The idea of driving a big and cumbersome vehicle was scary for myself (Sharon) and the idea of parking it even scarier. 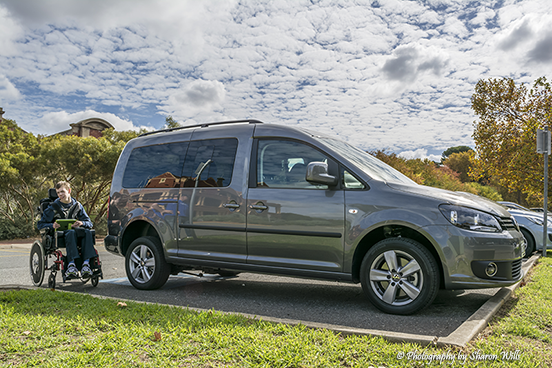 The VW Caddy is much smaller than the vans that we had assumed we would need to explore, more in line with a station wagon and in fact it is classified as a station wagon and not a van by the manufacturer. Although not the most attractive vehicle, it is well made and finished off nicely with basic features that make the vehicle comfortable to drive and travel in. The inclusion of climate control is a bonus and reversing sensors make reversing less stressful. Having a diesel engine also has it’s perks with reduced running costs from what it would be with petrol and better overall performance. The reason we were looking in this direction was based on advice sought from Les Brazier, the company that provided the vehicle and did the modifications. It is also a vehicle they happened to have on show and to borrow/lease allowing us to test the viability and ease of use of the vehicle before committing to any purchase. Another redeeming feature is that it allowed for 5 seats as well as the wheelchair, meaning that we could fit the entire family, as well as two additional people. That’s 6 in total, which as you can imagine is extremely handy. Considering it’s smaller size it has a huge capacity in this regard. A standard van would allow for 4 seats only, making the capacity 5 in total. Despite having more seat capacity the back seats are still roomy and more than sufficient to hold 3 adults facing forward as would be expected in a conventional vehicle. We had initially intended to purchase a reliable newer vehicle, rather than new, that would suit the purpose with the intent of saving money, but suitable vehicles of this nature could not be found. They either had too many km’s on the clock or they were too old and better suited to scrap metal. People just don’t sell their vans, they keep them until they die. Reliability was always a main factor and something we would not compromise on. Being stuck on the side of the road with a seizing, wheelchair bound child was never going to be an option. Secured the spare tire usually under the floor to the inner side of the vehicle. Added the motorised winch and straps for securing the wheelchair. Note this does not assist with getting Jarod and the chair up the ramp, this is still a manual push task, but not too difficult. Added all securing points etc. Finished off all modifications so they blended seamlessly with the existing décor. opted to take the VW Caddy converted lease car out for a weekend trial. 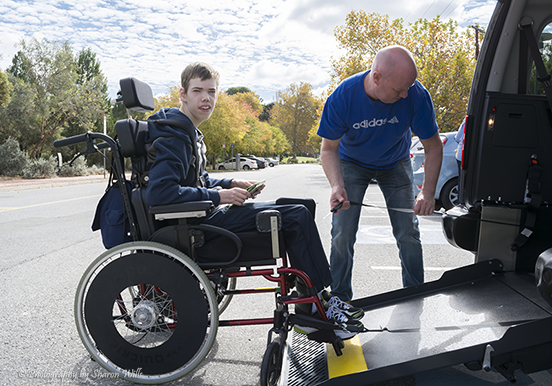 It turned out to be quite easy to drive and although the ramp and securing of the wheelchair was tricky it became obvious that it was just a matter of getting used to all the steps and once we got used to it, it would become second nature. This proved to be true. Applied with Variety Charities for funding to assist with the vehicle and/or conversion. Stating that any assistance would be appreciated. This process including supplying supporting documentation from ourselves, from our physio and financial information which would be used to determine our financial need, as funding is based on financial hardship. It was a couple of months later when Variety made a determination and offered to pay $25,000 toward the costs, essentially covering the conversion cost of the vehicle. The final cost was $64,935 including 3 months registration, $25,000 paid by Variety and $39,935 by us. The price for the vehicle and the price for the conversion is somewhat blurred, but I tend to think of it as we paid for the vehicle and Variety paid for the conversion. A fee was also required to get the vehicle in Jarod’s name transferred from Les Brazier’s ownership. By purchasing the vehicle in his name we saved on stamp duty. This is also good to know. We are more likely to take Jarod out with us as a family, rather than leave one parent at home with Jarod. I.e. for shopping etc. We love the vehicles reliability and ease of use, it’s a very comfortable, easy to drive vehicle. We would have done it sooner in hindsight, if we knew how easy it would be. As an aside and not necessarily in answer to this question, we do have one issue, but I’m not sure we can do much about it. We have a bad habit of leaving the electric? winch on when we finish using the car, which is comparable to leaving the car lights on and as a result we have had to call road side assist many times to recharge the battery, we have since bought our own battery charger, but we are getting better at remembering to turn the winch off. I guess this has already been outlined above, I can’t think of anything else other than to say it is making life easier in general. I’d highly recommend contacting Variety and any other charity you believe might be able to assist with the financial aspect of your purchase, let’s face it, it is not the vehicle you would likely buy if your situation where different and financial stress doesn’t help anyone. Variety have been exceptional in this way. Les Brazier are also a great resource and leasing a vehicle before you buy can save you a lot of heart ache by working out all the potential problems and/or advantages in advance. It’s one thing to work through something in theory, but often entirely different when you test something physically. You are guaranteed to add something to that problem/advantage list before you are through and at least this will allow you to work through the problems and find solutions before committing to an investment that will need to work for many years to come. Lastly consider the needs for the future, a car will need to function for you for 10+ years, it’s an investment in your future. Will an adult wheelchair fit? What about an electric wheelchair? Is the family growing? What about your kids friends, do you have room for them too? What about elderly relatives on Christmas day when they are too old to drive themselves? Lastly don’t procrastinate, do it now if the need is there. Don’t leave it like we did. Submitted 30 August 2016 (by Sharon Wills). What is Dravet Syndrome? In Shazza Language A laymen's guide to Dravet Syndrome symptoms, treatment options and more importantly what drugs should likely be avoided. What is SMEB? In Shazza Language The sister article to What is Dravet Sydrome? In Shazza Language describing SMEB (Severe Myoclonic Epilepsy Borderline) and the differences between SMEB and SMEI / Dravet Syndrome.